Many women who self-catheterize have long wished for a more practical, discreet catheter: a catheter that can be used outside the home environment without compromising safety. With SpeediCath Compact, Coloplast has developed an innovative solution. SpeediCath Compact is a single-use intermittent catheter, which is sterile, pre-lubricated and easy to use. And thanks to its ingenious packaging design, SpeediCath Compacts is incredibly discreet. SpeediCath Compact increases safety for catheter users. Hygienic insertion is achieved through a unique non touch grip and sterile saline solution inside the packaging. The combination enables the fingers to stay well away from the catheter and eliminates the need to soak the catheter prior to insertions, reducing contact points with the septic environment. The narrow width of the catheter and coated eyelets minimize both contact with the urinary tract and pressure on the bladder wall. SpeediCath Compact is the perfect length for female urinary tracts. The female urethra on average is just 1.25" - 2" long - significantly shorter than the male urethra. With a catheter length of 2.75", SpeediCath Compact is tailor-made for the typical female anatomy. In a clinical study, SpeediCath Compact was documented to be at least as efficient at emptying the bladder as a conventional female catheter with a length of 6" - 8". SpeediCath Compact increases the convenience of catheterization. SpeediCath Compact eliminates concerns over catheter preparations and quality of the hydration source. The catheter comes pre-hydrated in a ready to use package. Simply break the seal and pull open the telescopic packaging - the catheter is ready to insert. SpeediCath Compact increases discretion for catheter users. when un-opened, the catheter package is no larger than a lipstick. 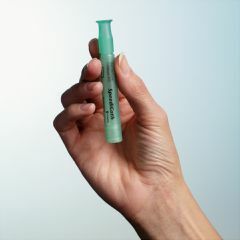 This ingenious packaging design makes the catheter extremely discreet - without compromising performance. SpeediCath Compact has polished eyelets for even greater comfort during insertion and withdrawal of the catheter. SpeediCath Compact is 100% PVC free and therefore does not contain DEHP or other phthalates. Lightweight. Easy Storage. Safe. easy to dispose of. discrete. Tricky to open. Tricky to open. female. Have to Self-Cath for MS. neurogenic bladder. Chronic UTI. Wish it was a little long. Have to Self-Cath for MS. female. Disbled. Have to self-cath. female. Average Health. My husband and I travel internationally on vacations. I find the size for packing in luggage and carrying in pocketbooks is perfect. The ease of use while in public restrooms is very good. Products not complete . Products not complete . When you are at a friends house, how do you dispose of it? It doesn't push back into tube. I wrap it in toilet paper, put it in a ziplock bag, put it in my purse. Dispose later. What disinfecting vaginal wipe do you use to prevent UTI prior to self-cathing? Is soap & water more or as effective? Benzalkonium Chloride Antiseptic Towelettes - 5 1/2" x 7", from Allegro Medical. Do not get the cheaper ones--too dry. I got off of baclofen that was causing incomplete emptying. Before that though I was told to cath 3-4 times a day, Made me sore. More lub maybe? I wonder if you would have the same trouble using what is called a hydrophyllic catheter. It has a special coating that is activated by water. It is not, however, compact like the speedicath. Sometimes using a smaller catheter helps, but the smaller catheters can be too soft and hard to insert. I used to use a 14 french cath and had the scraping sensation. I use a 10 french @ home for intermittent cathing, and a 14 hydrophyllic when I need to do an infusion. I do not feel any scraping with the hydrophyllic catheter, even though it is like a straw. You may want to order a couple of different catheters and sizes to see what best meets your needs. I only use the speedicath when I am out and around. Another option is to talk to your Dr. and see if maybe using viscous lidocaine to lubricate the catheter would be appropriate. I do that when I am having a bladder flare (I have IC). I may be disqualified because I'm male, but I once had a problem with the "scraping" while inserting and removing caths. I tried the Cure brand caths and the scraping went away. They have polished eyelets that are smooth to the touch. Disclaimer: I have no interest in the "Cure" brand financial or otherwise. from what i have read and learned some of my sisters friends like mitrofanoff and they also truly benefit from using this product. Actually I would say NO the female would be too short for her - it is only 2-3 inches of insert able material. The male Speedicath may work for her though, as it is a more standard length. Is this product developed for someone who has a medical problem? Why is it used? What exactly is a speedicath? Asked on Jul 6, 2011 9:52:55 PM by L from Jacksonville,Fl. People use catheters if they are unable to urinate or fully empty their bladders, generally because of neurological issues that are congenital or caused by accidents or certain illnesses. This product is useful for women because it is smaller than most "caths" and more convenient and discreet when away from home.